From the moment you spot the enchanting coastline of Capri, the island begins to weave its spell on you. Situated in the Mediterranean five kilometers from the Italian mainland, Capri has defined itself over the years as the place to escape. From the trendy, people-watching mecca of Capri's main town to the more subdued retreat of Anacapri, the island's magnetic charm has drawn visitors from all over the world. 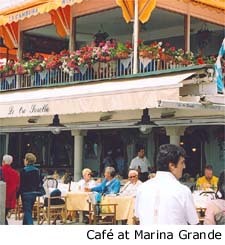 On the day I arrived in Capri, I couldn't help thinking of my first trip to Paris. I had a preconceived notion that Capri would be inundated with tourists and not to my liking – this is what I had thought Paris would be like as well before I fell under its spell years ago! Before visiting Capri I thought, "Isn't that where everyone goes?" 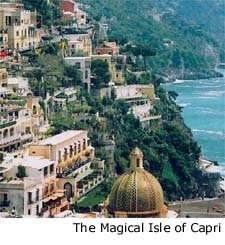 Now I know – yes, lots of people visit Capri, for good reason! What Anne-Marie and I had the pleasure of discovering during our time on the island is that, after buzzing all day with its eclectic dose of daytrippers, the island settles into its small town roots at sunset. A full day of first-rate exploring and five-star dining can be completed at a café in Capri's main square watching the crowds board the ferries and depart for Naples or Positano. When Anne-Marie and I sped away from the Italian mainland headed to Capri on an early morning hydrofoil I was watching both the looming outline of Mount Vesuvius and the spectacular Amalfi Coast disappear in our wake. When I turned and saw the coast of Capri jutting up from the deep blue waters of the Bay of Naples I was startled by its beauty. As the boat drew closer I could see the lovely town of Capri perched high on the hill above the harbor and the dramatic outline of the island’s Mount Solaro to the west. The hydrofoils, which take about 40 minutes to travel from Naples to Capri, and ferries (which take a little over an hour) all arrive in Marina Grande, a busy seaside town that absorbs and distributes a daily infusion of visitors. After falling in love with the Italian countryside I wasn't sure what this little island in the Med would offer but as we docked and went ashore I knew I was already under its spell. We had arranged with an Italian travel service to make all of our Capri arrangements for us – they picked us up at the Naples airport, drove us to the ferry dock, collected our ferry tickets, handled our luggage and put us on the ferry to Capri. When we arrived in Capri the service rep met us at the dock, helped us with our luggage and drove us to our hotel in Anacapri. The service they provided smoothed out the bumps in Italian travel and provided us with something priceless - peace of mind. The island has two main areas – Capri and Anacapri. From Marina Grande we could see the town of Capri perched on top of the cliff high above us. Although a few brave souls choose to walk several miles up the steep hill to town, most people hail one of the many convertible taxis or ride the scenic funicular - the rail car - up the cliff. We actually bypassed Capri town our first morning and went along the coast and around the mountains to the small town of Anacapri to our hotel, the Capri Palace. A five-star luxury resort built in 1962, the Capri Palace hugs the cliffs 300 meters above the Bay of Naples and the Mediterranean Sea and is one of the most idyllic honeymoon spots I have ever seen. 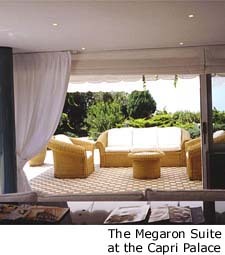 Upon entering one is immediately calmed by the white fabrics that compliment the classical Mediterranean architecture. The exquisite vases of calla lilies added a subtle yet regal touch around the hotel. Although all of the 77 rooms are gorgeous, six of them have their own private gardens and swimming pool. The grand Megaron Suite has its own hanging garden, swimming pool and mesmerizing view of the bay, while the Acropolis penthouse boasts a shell-shaped hot tub with views across the sea. 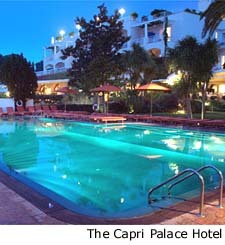 Anne-Marie decided that the Capri Palace was the most beautiful hotel she had ever visited. Afterwards she added that the hotel offered the best service of any place she had ever stayed. Although it is definitely five-star luxury, it still manages to be very casual and extremely comfortable. The staff was so hospitable that we felt that we entered as guests and left as friends. The hotel offers several packages, one of which is a dreamy, five-night honeymoon that includes a night on a 30-foot yacht complete with candlelight dinner, spa treatments for the lucky couple and a private picnic on a secluded mountaintop. Not surprisingly, the hotel is classified in the international and Italian press as the "Hotel of the Stars" and accommodates rock stars, Hollywood celebrities, and high-fashion gurus as well as those seeking a respite from the busy world.